This chicken rice with shiitake mushroom dish is inspired by the traditional chicken rice made in claypot, becoming my all-time favourite. The rice is SO delicious!!! 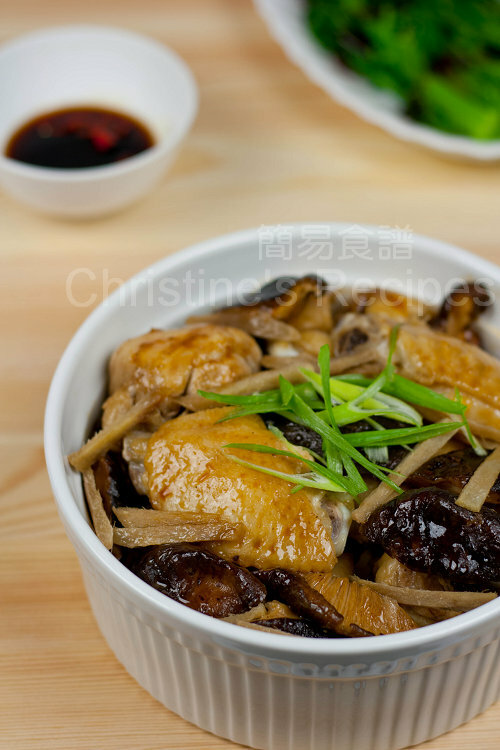 This steamed chicken rice is traditionally cooked in a claypot. As you might know, it’s a challenge to cook rice in a claypot, not as easy as in a rice cooker that we are familiar with. Needless to say, the rice at the bottom of a claypot would be burned. Many people, including my father, love the burned rice very much because of its crunchy texture. Unfortunately, none of us in my family likes to eat the burned rice, so it’d be a waste for us in certain sense. Here's my take on making delicious chicken rice. I used steaming method to cook this traditional Chinese dish. All the goodies and flavours are well absorbed into the soft rice, similar to be cooked in a claypot. The chicken is just cooked with the right doneness, tender and juicy. Soak shiitake mushrooms in warm water until softened. If they are big, cut them into two halves. Mix with marinade. Chop chicken into smaller pieces. The chicken wings I used were without the tips. For the drumsticks, I chopped them into halves. Be cautious. By chopping the chicken bones, some might be broken into small pieces. Thus, use a sharp and heavy knife to chop and try to chop on one go. By doing this, it might reduce broken small bones. (Note: When it comes to cooking this dish, Chinese people like to choose those chicken parts with bones on because the dish tastes much delicious.) Or you might like to use chicken breast without any bones intact for the sake of young kids in your family. Marinade the chicken for 30 minutes. Rinse rice and drain well as you do as usual, yet add less water to cook because you don’t want your rice too soggy and mushy after adding chicken and marinade into it. Basically, add 80% of water that you used to cook rice. Transfer rice and water into a large, deep bowl. Steam in a wok over high heat for about 20 minutes, covered, or until the water in the bowl dries up. Add chicken and mushrooms, sprinkle ginger. Continue to cook for 20 minutes, covered. Turn off the heat, let chicken and rice sit in the wok for another 10 minutes. Garnish with spring onion. Serve hot. If you have a rice cooker, you can cook this dish with it. Cook rice as you usually do, but add less water. When heaps of steam releasing out from the rice cooker, it means the water is boiling. When the steam reduces, the water inside begins to dry up. Quickly add chicken and mushrooms with marinade, sprinkle ginger. Cover and let the rice cooker continue to cook until it’s done. Little reminder: if it’s too late to add chicken, the chicken can’t be cooked enough time. Or it’s too early, the chicken will soak in the rice water too long. Both cases would not produce the best results. Timing is a crucial element of cooking this dish. MmmmMm...I can smell the dish right now as I'm reading this post. Your photo looks awesome! Chicken and mushroom always pair so well with each other. 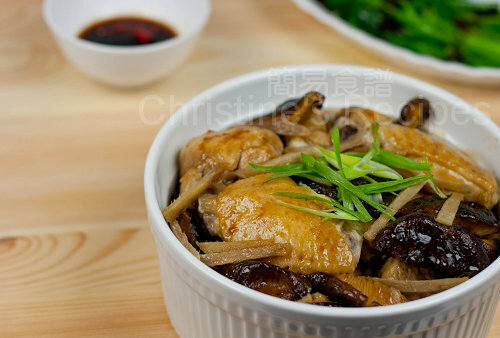 Claypot chicken rice is delicious and I cook it often. It helps to have a well seasoned pot so that there isn't too much sticking at the bottom. Steaming it though, is a really good idea as steaming produces such fluffy rice. I love your pictures! The food looks absolutely delicious. Wow, this looks really heavenly. Lots of flavor for the chicken and the rice when it is cooked this way. I'm hungry again. My mum cooks this! Thaks for sharing. Chicken wing is my favorite though I know it is not the healthiest part. But I just love it and I can imagine the moist juicy chicken wings with the steamed rice. I am so hungry now! cooking this or any flavoured rice with claypot is not that hard, and the bottom would not be burnt but will be sort of abit hardened. All you need is a "flame diffuser" or heat diffuser between the flame and claypot. Bring the rice and water to the boil, then put the diffuser between flame (heat) and claypot and put on medium flame. This will distribute the heat very evenly. Yes, my family favourite! That looks really delicious. I have to cook a BIG pot so that we don't fight LOL. Thanks for your info very much. Mine is a ceramic glasstop. It seems that we don't have any diffuser you talked about around here. Well, I might miss them anyway. Should get one if I find it. BTW, my family loves eating soft rice, they say "no" to any hardened, or dry rice. The steamed rice was a big hit in my family. Oh my, Christine! That looks SOOOO good!!! 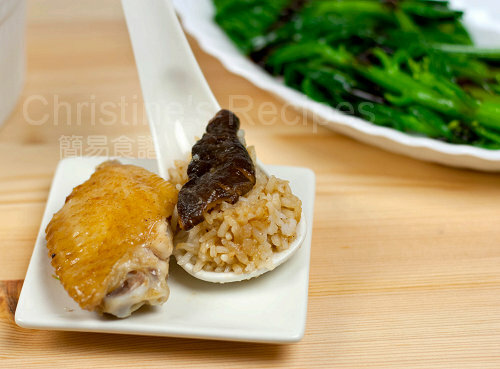 Christine, that chicken rice looks so irresistible! Looks like a nice recipe. I like your photos. A scrumptious rice & chicken dish! I love the shiitake mushrooms addition! Christine - you are AMAZING! That chicken - especially that first picture - WOW! It looks so delicious and inviting. I have earmarked to try this recipe soon! oh wow I like the colour of the chicken! Looks so god! Love one pot rice. Thanks for the good work Christine! You are def a life saver! I make this dish frequently now, cannot tell you how good it is, and how much time it saves! Just a request, would it be possible to post up more recipes using the rice cooker?? I'm at loss what else to do! Thank you so much and keep it up! I should try this as my rice cooker method of cooking chicken rice does not work well. It's perhaps because I cook only 1 cup of rice and there is not enough steam to cook the raw chicken and the cooker does not have a keep warm function. I also found it quite troublesome to half cook the chicken before I put it into the rice cooker. This steaming method seems easier. One additional step I'll do is to pour in a beaten egg onto the cooked chicken rice before I eat. This gives the rice an added fragrance. Further, I'll use sesame oil instead of vegetable oil. I tried your 'steaming' method and it turned out better than my attempt in using the rice cooker. But the rice is a little soggy. Your recipe just says "water to cook rice". How much water should I add for 2 cups of rice ? The amount of water to cook rice depends on what kind of rice and what cookware you use. As for my case, whenever I make steamed rice, I use 1.5 cup of water to cook with 1 cup of jasmine rice in my rice cooker. If steamed with marinated chicken, I only add about 1.2cup (80%). Basically, you can scale down to about 80% of the amount of water that you used to make plain steamed rice. This is similar to Hong Kong Chinese restaurant's lunch hour 盎仔飯, which are always my favorite! I tried this recipe tonight for the first time using the steam method. The rice and chicken turn out pretty good and as expected. Like you said the amount of water and timing is important. I also use cut-up chicken leg (for karaage) bought from Japanese supermarket so that I don't need to mess with chopping them (I am really not good on this). Next time I make this again, I will marinate the chicken with little or no dark soy sauce since I like to serve it with Lee Kum Kee Sweet Soy Sauce (煲仔飯豉油). Thank you very much for providing such easy and tasty recipe! I'm with you. It's an easy and quick version of 煲仔飯. Love to serve with LKK sweet soy sauce. Yummy ! Sure, you can. I think you can get more control of how the chicken is done by doing so. Hi Christine thanks for the recipe. Just tried for the first time tonight and Hubby loved it! I rarely cook for the family despite being the wife because nothing ever turns out right but I followed your instructions to the T and it turned out wonderfully! Can't wait to try another recipe tomorrow night! So happy for you. You'll getting there. Glad that your hubby loved this dish. I used rice cooker, and chicken breast. Added 80% water, and my rice turns out really dry. Should i add more water? Yes, add more water if you find your rice a bit dry. The water absorption of every kind of rice is very different. If i want to add Chinese sausage (lup cheong), is there a need to marinade it with the chicken ? Or add it with the marinated chicken ? I'd recommend to marinate the chicken, then place the chinese sausage on top. Thank you for sharing your recipe, it's so easy to prepare and super tasty. Glad that you liked this recipe. Happy cooking!